Now, the couple Diana Yano-Horoski and her husband are big supporters of President-elect Donald Trump and have no hard feelings against Mr. Mnuchin, his nominee for Treasury Secretary.After they are spent many years in court fighting efforts by Steven Mnuchin’s OneWest Bank to foreclose on their home. Five years ago, foreclosed homeowners protested on the lawn of Steve Mnuchin’s Bel-Air mansion for his company’s ‘repulsive’ practices. Now President-elect Donald Trump's nominee him for treasury secretary . 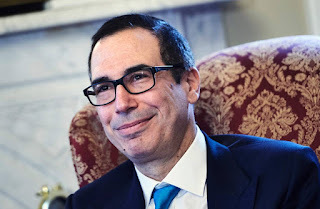 Steve Mnuchin served as Trump’s national finance chairman during the campaign after a long history in private investment banking and on Wall Street.He worked at Goldman Sachs for 17 years and OneWest Bank, which got into hot water for a series of attempted home foreclosures after the 2008 housing bubble burst. No Comment to " Mnuchin’s Bank Foreclosed on This Couple. Now They Support Trump "